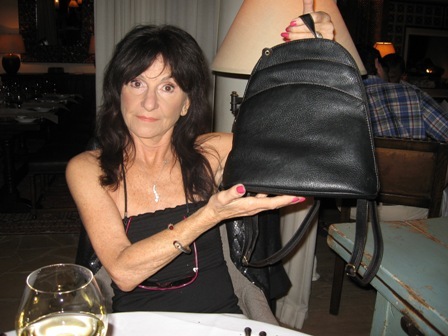 That’s the Diva at Morgan’s at La Quinta Resort &Spa holding up a new, spiffy backpack purse her husband gave her for her birthday. It was just one of many treats. Seems like going to the Desert for my birthday has become a tradition. Last year I spent it with Richard (herefore mentioned husband) at Morongo. And that was great,too. Breakfast on the balcony. 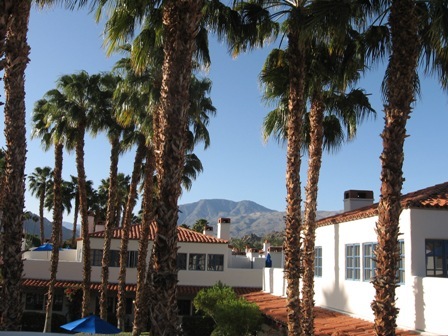 La Quinta sets off a magical charm when you enter the Spanish-style lobby to register, everybody’s so nice, the atmosphere so relaxed and you feel more like you out of the country than just a 2 hour drive away from Los Angeles. That’s a view from the Freeway. I’ll give you a few highlights: (The decades old resort has nearly 800 guest rooms of various sizes and shapes, all with flat screens, fireplaces, some balconies,some patios, some private pools and Jacuzzis, all charming and comfortable and priced from $199 in season to a $5,000 for the top suite). 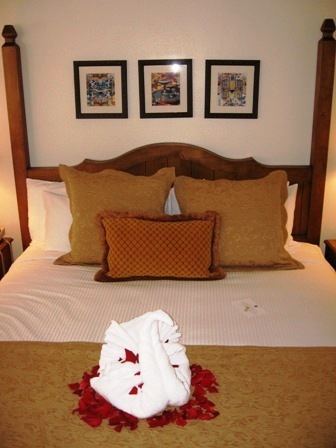 Bedding down in our Starlight Casita (the maids made a special welcome swan out of towels) with a balcony providing magical mountain views and privacy for relaxing or enjoying room service breakfast. 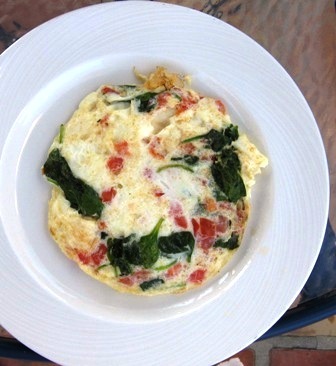 Great fritatas and perfect scrambled eggs. 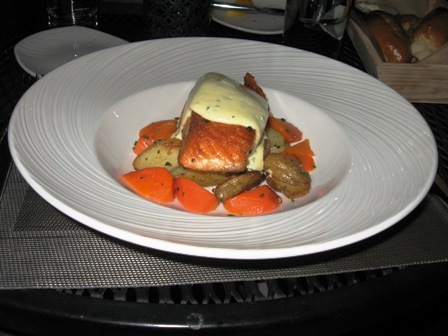 Dinner in Twenty6 (delicious salmon), massage (Jeremy went deep) and steam at the charming, 23,000 square foot Spa; working out in the Diva-approved fitness center (has all the right stuff). Swimming in the clean, warm pool that’s just a few steps down stairs from our bedroom. Took a photo but it got deleted, bummer. But trust me, the pools are great. Transcendental atmosphere framed by snow-capped mountains, fertile with grapefruit trees, stately palms, plants, flowers with musical accompaniment of chirping birds. Lots of action with locals flocking for drinks and/or dinner. Lots of hotel guests, energy, yet plenty of privacy. The nice people at the resort. Dislikes: the $27 resort fee; the $25 entry fee for the Spa if you’re not getting a treatment; the chintzy towels provided in the room for use at the pool. Need big,fluffy ones. Factoids: Once a maven for movie stars and moguls from Frank Capra to Greta Garbo, La Quinta Resort & Spa provides the perfect escape from LA, or out of town. You can fly into Palm Springs Regional Airport, to LAX or drive (go to www.google.com for map from your area). 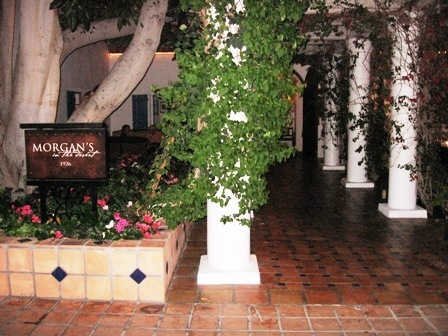 I’ll be reviewing Morgan’s at www.thediningdiva.wordpress.com and at my examiner.com site, because it’s too good to share space with. Big Bear now sports a 5,000 square foot outdoor Ice Garden Skating Rink– the first of its kind in Big Bear Lake since Iceland closed its doors 3 decades ago, and the first outdoor ice rink since the Spalding Big Bear Woods Ice Rink disbanded in the 1930s. The Diva hasn’t put on a pair of skates in a long time, but just might get back on the ice since they’re also offering lessons–and I will need some. Anyhow for those of you who can, take the kids and check it out. The new ice rink gives visitors another option for winter fun. 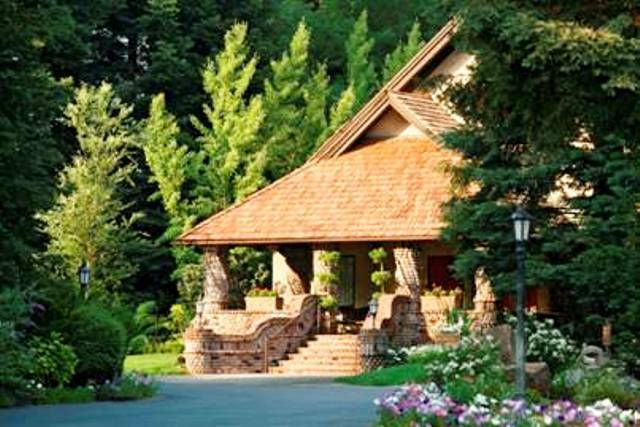 It’s an activity the entire family can enjoy together, a romantic outing for couples, excellent exercise for all ages and a therapeutic remedy for city dwellers who just want to unwind. Ice Garden Skating Rink is open for recreational skating seven days a week starting December 11 through the first week of April, weather permitting. The Rink’s open from 12 noon to 6 PM Sunday through Thursday and 12 noon to 8 PM. Fridays and Saturdays. Single skate session prices are $8 for adults and $6 for children 13 years of age and under. Skate rentals are $4 per person. 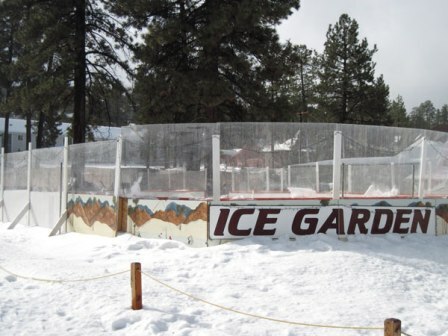 The pond style outdoor rink offers skating lessons for all skill levels and holds special events, skating exhibitioIce Garden Skating Rink is the newest winter attraction in Big Bear Lake this winter. The 5,000 square foot outdoor ice rink located in the heart of Big Bear Village opens tomorrow Friday, December 11. It is the first ice rink in Big Bear Lake since Iceland closed its doors 3 decades ago, and the first outdoor ice rink since the Spalding Big Bear Woods Ice Rink disbanded in the 1930s. For more Big Bear Lake information check out www.bigbear.com or call 1-800-4-BIG-BEAR (1-800-424-4232). ns, hockey clinics and 3 on 3 pond hockey tournaments. 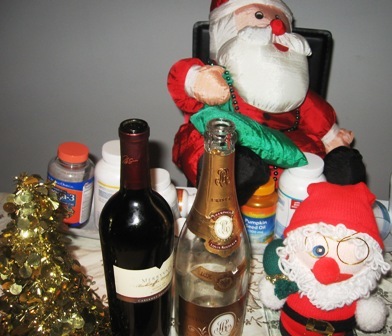 To get all the details on planning a winter getaway to Big Bear Lake and to book reservations online, log onto http://www.bigbear.com or call 1-800-4-BIG-BEAR (1-800-424-4232).